DINOSAUR JR. need no introduction. One of the most successful and influential alternative guitar bands from America, and fronted by laconic singer/guitarist J. Mascis, they’ve enjoyed global success and inspired generations, from Grunge onwards. First issued in 2002 only in the States and Australia, EAR BLEEDING COUNTRY is the only career-spanning compilation of Dinosaur Jr. This is the first time this collection has been made available outside of those territories. • DINOSAUR JR. need no introduction. One of the most successful and influential alternative guitar bands from America, and fronted by laconic singer/guitarist J. Mascis, they’ve enjoyed global success and inspired generations, from Grunge onwards. 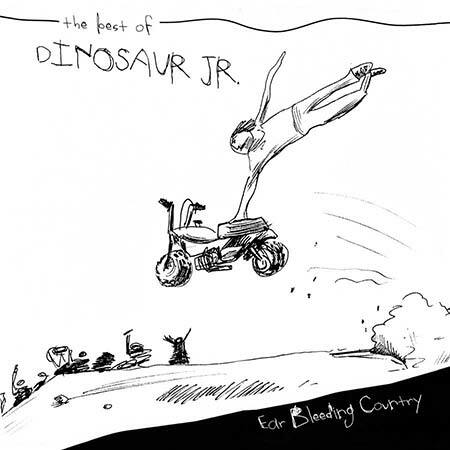 First issued in 2002 only in the States and Australia, EAR BLEEDING COUNTRY is the only career-spanning compilation of Dinosaur Jr. This is the first time this collection has been made available outside of those territories. • With the full support of the band, EAR BLEEDING COUNTRY now boasts a whole second CD of highlights from the band’s career, bringing the story up-to-date in 2018, with selections chosen by the band’s huge fan base. • The first six tracks on Disc 1 and the first three tracks on Disc 2 are drawn from the band’s early career in the 1980s, when they recorded for independent labels like Homestead and SST. Among them are the classic single ‘Freak Scene’ and the follow-up cover of The Cure’s ‘Just Like Heaven’. • Most of the compilation samples the best of Dinosaur Jr.’s output after signing with Warner Bros in 1990, including hit singles such as ‘The Wagon’, ‘Whatever’s Cool With Me’, ‘Out There’, ‘Start Choppin’ and ‘Feel The Pain’. • Also included are two tracks by J. Mascis’ post-Dinosaur Jr. band The Fog and tracks from Dinosaur Jr.’s more recent albums (issued since 2002, when Ear Bleeding Country originally came out), including the band’s most recent single ‘Hold Unknown’! • This package has now been remastered and includes original sleeve-notes by Byron Coley and a new introductory essay from Dinosaur Jr. fan Henry Rollins! • The original compilation (i.e. Disc 1) is also available as a limited edition white vinyl double-LP!